Feel like getting hot and sweaty on your trainer? Join me and my 7-11 team mates for a ride with Zwift on December 2nd at 10am mtn time. 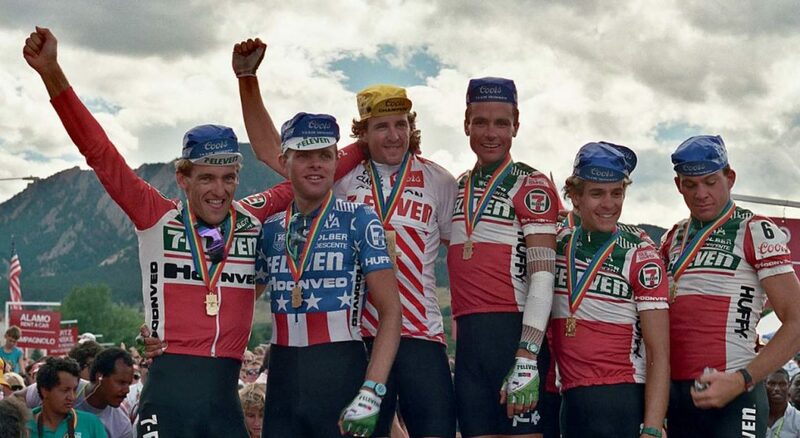 I will be riding at the Rapha store with Davis Phinney in Boulder, Colorado with a live video feed happening. Or so the kids tell me, I don’t know much about this connected by video world. I do know that we did one last year and it was fun, and my buddy Paul in London joined us. Joining us from around the globe will be 7-11 alumni Jens Veggerby, Dag-Otto Lauritzen, Tom Schuler, Scott McKinley, Norm Alvis, Thomas Craven and Alex Stieda. The charity we will raise funds for is the World Bicycle Relief organization. They bring sturdy bikes to people in developing countries. World Bicycle Relief gets good bikes to people in places that can really use them, and is a charity we hope you will give to. I hope to bump into you on Zwift. Nice riding with you today, Andy. Hope to see you on the road next year. You’re having too much fun, Andy. Maybe that’s why you’re staying young! I’m still putting 200 mi./month on the same Serotta Ottrott that I crashed into that ditch near Bibbona in Sept. 2008. Luckily, my fellow Cinghiale alum and friend Bill Watson was close behind and got to me in time to release my helmet strap, which was trying to choke me to death. I’m working on Kim to agree to accompany me to Castagneto again one of these years — but it’s a deal-breaker if I bring my bike.